Children under the age of 4 who do not wish to occupy a place, therefore they will not be entitled to a seat, they can travel without a ticket accompanied by an adult. Children under the age of 4 will also have the possibility of occupying a seat, therefore having a seat with the ticket means that it will not be for free but it will get a discount for children. Children under the age of 12 will get discounts on their tickets and cheaper train tickets, discounts are usually 40% of the basic fare of the ticket. Children of 12 or 13 years will get discounts on their tickets and cheaper train tickets, discounts are usually 40% of the basic fare of the ticket. In addition, in travelling by AVE from Madrid to Seville, there is no possibility of losing our bags, we always carry them close. It is the moment for the booking of your tickets for AVE from Madrid to Seville Â¿Do you have any doubt about what are the best timetables for departure from Madrid and for the arrival in Sevilla Santa Justa? What is the average price of tickets AVE Madrid Seville? 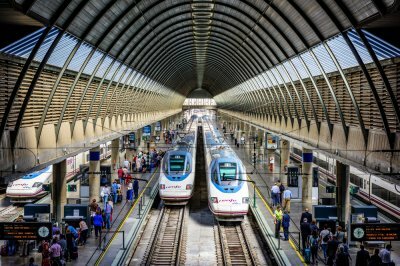 Â¿How can you get the cheapest tickets for AVE Madrid - Seville or the tickets that suit better your travel? Are you looking for the AVE tickets Madrid - Seville at the best price? They are also looking for you on Trenes.com! 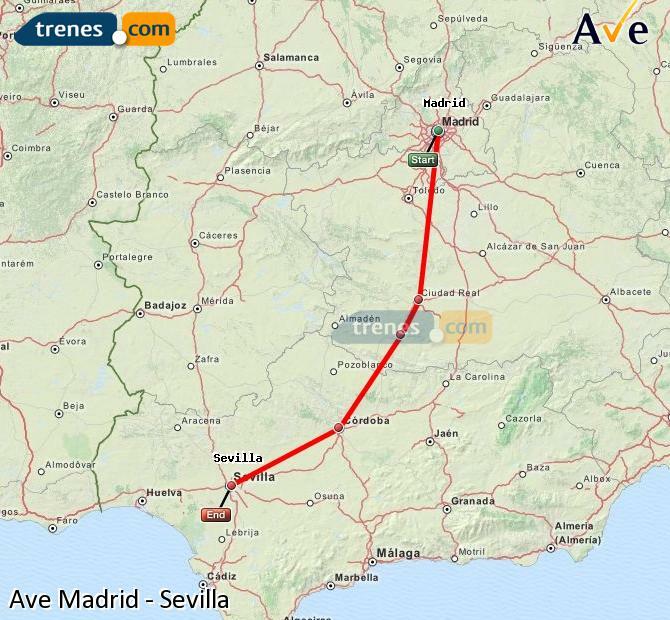 Check the timetables for AVE from Madrid to Seville on, AVE schedules Madrid to Seville. We are glad to inform you about the main issues regarding tickets for AVE Madrid Seville in order to clarify any doubt you might have and for you to benefit from the best prices in AVE tickets from Madrid to Sevilla Santa Justa. Do not make things easy, difficult, book with us your tickets AVE Madrid Seville. Equally, for the return, AVE Seville Madrid. The average time on travelling with our tickets AVE Madrid Seville is of 2 hours 34 minutes, but we can get even better travelling time, reaching Sevilla Santa Justa in 2 hours 21 minutes. Under all circumstances, the maximum time of travelling 390 Km needed to travel from Madrid to Seville is of 2 hours 56 minutes. Without queues or waiting, buy your tickets AVE Madrid Seville at the best prices. The search for the AVE train ticket from Madrid to Seville for the best price was made on the 24/03/2019 a las 20:08 h, it is a AV City train with departure on the 03/04/2019 a las 6:20 h and arrival on the 03/04/2019 a las 9:16 h. The price of the cheapest ticket has been 33,60 € and the cheapest rate possible for this ticket has been the Promo fare. Trenes.com issues official AVE Madrid Seville tickets and it does totally legally as a verified and authorised travel agency by Renfe, ie if you buy a AVE Madrid Seville ticket through our website, you only need to print the ticket or to show the bidi code sent to the mobile phone, present it at the Madrid Atocha station and get on the train you have got assigned. 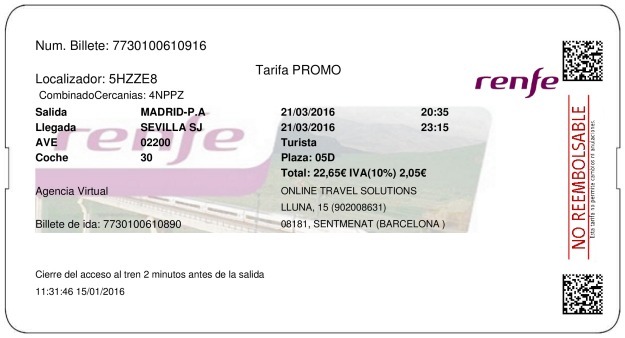 This is a real example of a Madrid Seville ticket issued by Trenes.com. On it you can see the ticket number 7730100610916, the locator 5HZZE8, the origin and destination stations, in this case the train travels from Madrid Atocha to Sevilla Santa Justa. The railway operator Renfe, the train type AVE, the train number 02200 and the rail car 030. The contracted rate Promo in Turista class, the assigned seat 05D, the price for the ticket, this Madrid Seville train ticket is not necessarily the cheapest ticket since the price of the train ticket often depends on the time in advance with which you bought the ticket. In this case the price is 22,65€ and the departure date is 21/03/2016. The train departure time of this ticket is at 20:35 h and the arrival of this train at the Sevilla Santa Justa station is at 23:15 h. The duration of the journey from Madrid Atocha to Sevilla Santa Justa has been 2 horas 40 minutos. Knowing this, ¿do you want to know how to optimise your travel by AVE Madrid - Seville? It might be useful knowing what timetable is the best regarding the reduction of time to start the travel from Madrid and arriving in Sevilla Santa Justa. It is very simple, we have those AVE trains that start their route from Madrid at 15:00 h, this is the best departure time regarding the shortness of travel Madrid - Seville or if we base it on the arrival hours at the station Madrid in Seville, the proper arrival time would be at 17:21 h, but in case we do not need to hurry, and the AVE ticket from Madrid to Seville is cheaper, since we are comfortably travelling by AVE and it is possible that we do not care if the travelling time by AVE Madrid to Seville takes a little bit longer, we have, on the other side, an AVE which leaves the station Madrid at 6:20 h and one which reaches the station at Sevilla Santa Justa at 9:16 h. A trip to Seville without losing your nerves, or your luggage? By AVE with the cheap AVE tickets Madrid - Seville that we put at your disposal. If we talk about the costs of tickets AVE Madrid Seville, the cheapest price we try to offer with our tickets search engine for AVE Madrid Seville is of 33,60 € and the largest amount will be at most of 128,50 €. Leave at 15:00 h if once you have reduced the amount of your tickets AVE Madrid Seville, you want to reduce your travel time. The largest AVE train station in Seville is called Estación de Sevilla - Santa Justa. With the Expo'92, the imminent need arose to expand the station in order to facilitate access to the number of people who would come to Seville. After few years of work this station was opened to the traveller on May 2, 1991. As a result, two stations had to close, the Plaza de Armas and the one of San Bernardo. Both were replaced by Santa Justa. The station of Santa Justa is large and it occupies a total area of ? ?80 000 square meters. It has six international gauge tracks reserved for the circulation of the AVE. The materials that dominate the construction of this railway installation are brick, steel and glass. The access is through the ground floor through an elliptical cover and then we find a spacious lobby. In this lobby we find all kinds of services: cafeteria, currency exchange, gift shops, etc. In the outside we will find other services such as parking, car rental, taxi services, etc. Santa Justa is not far from the historical centre of Seville and it offers good road communication. The journey in the AVE from Madrid to Seville lasts approximately 2 hours and 56 minutes. The kilometres that separate Madrid from Seville are 390. Traveling in AVE means traveling with endless advantages. In addition, this means of transport is much less polluting than other means such as the airplane and private car, CO2 emissions are very low and the railway service will continue to be managed in such a way that the AVE and trains continue to be a means of transport which are very sustainable. Trenes.com uses own and third-party cookies in order to improve the experience of the customer and to offer content tailored to its needs. Copyright © Trenes.com. All rights reserved.